The JJ Cole Bucket Tote is a simple and stylish way to carry all of your baby's necessities. This super roomy bag features 12 pockets in total, including one zippered compartment and a phone pocket in the front. The tote includes a matching pacifier pod, coordinating wipeable changing pad and a front-access key clip. A removable shoulder strap gives you more options for carrying, either over the shoulder or cross-body. The JJ Cole Bucket Tote is a simple and stylish way to carry all of your baby's necessities. This super roomy bag features 12 pockets in total, including one zippered compartment and a phone pocket in the front. The tote includes a matching pacifier pod, coordinating wipeable changing pad and a front-access key clip. A removable shoulder strap gives you more options for carrying, either over the shoulder or cross-body. You can also use the included no-slip grips to quickly clip it onto a stroller. SUPER SPACIOUS: The super spacious interior of the bag features four large slip pockets that are great for helping you to keep things organized. THE KEY IDEA: The exterior key clip features fine stitching details on 100% vegan leather that coordinates perfectly with this diaper bags straps. ALL INCLUSIVE: Diaper bag comes complete with a removable padded shoulder strap, no-slip grips™ for attaching to stroller, and a coordinating wipeable changing pad. 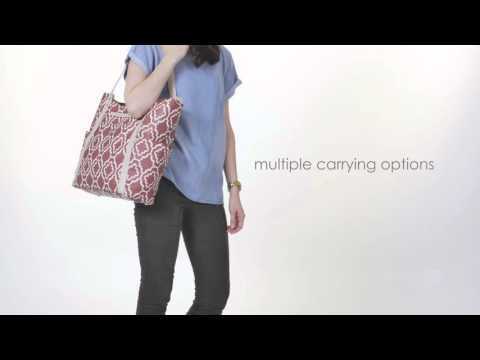 HAVE IT ALL: Utility and convenience, fashion and style. Our mission is to provide products that resonate with the needs and wants of today’s busy on-the-go parents.